Most of the major programs listed in the major programs section also offer minor programs. A minor generally consists of 18-21 credits of coursework in a discipline, but more specific requirements may be imposed by the sponsoring department. 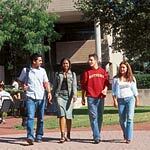 Half of the requirements for the minor program must be completed at Rutgers University–Newark. Students must consult the relevant chair or program director for full details, as well as file a declaration of intent to complete a minor in the academic department offering the minor. Students may apply for a minor in any of the professional schools at Rutgers University–Newark: Rutgers Business School: Undergraduate-Newark, the School of Criminal Justice, and the School of Public Affairs and Administration. Students may not use more than two courses towards both a major program and a minor program of study. The following minors are offered to students at University College-Newark. Requirements for each minor are described in the Academic Programs and Courses section of this catalog.